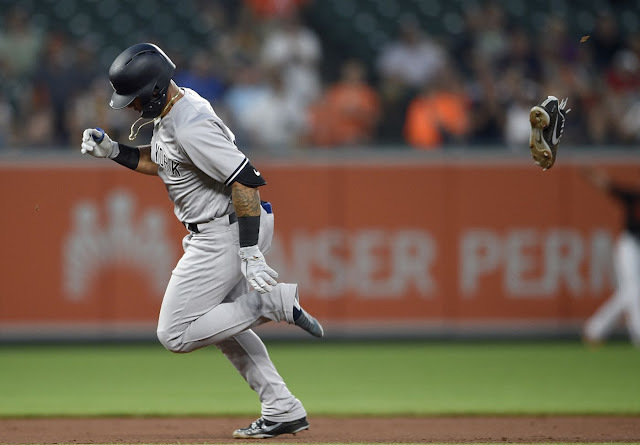 The Yankees didn’t beat the Baltimore Orioles 4-1 on Friday night solely behind the bat, feet, and arm of young Gleyber Torres but as usual, the youngster was in the thick of things as the Yankees won the opener of their now three-game series with the O’s behind solid pitching by Sonny Gray. Admittedly, I moved to pessimistic mode when Sonny Gray allowed the first inning solo shot by the great Manny Machado, but Torres changed my mood considerably when he singled in the third to score Neil Walker with the tying run. Torres led off the fifth inning with a double that he tried to stretch to triple but an uncooperative shoe that went flying off his foot altered his momentum with a slight stumble that allowed the outfield throw to reach third ahead of the sliding Torres. Although the Orioles announcer for the TV broadcast I was watching called the Yankees second baseman by the name of Gleyber Torreyes during the at-bat, Torres continues to be a very exciting player regardless of the outcome or how you pronounce his name. Greg Bird, showing why he is so highly thought of by the Yankees organization, tripled to the center field wall, when O’s outfielder Adam Jones misjudged his leap, scoring Brett Gardner with the go-ahead run. Gardy had singled after the shoeless Torres had been thrown out at third. Bird, please just stay healthy. We need you. I was very pleased with the overall performance by Sonny Gray. 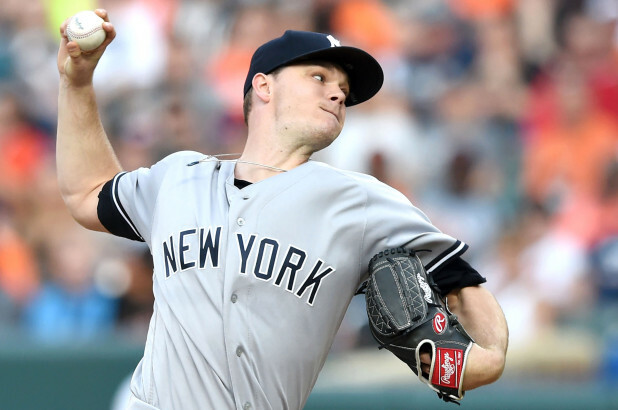 I can get so infuriated with his pitching but he delivered the way he was expected to when GM Brian Cashman summoned the former Oakland Athletic to the Bronx last summer. After giving up the Machado homer, he held the O’s to three meaningless hits and no runs before his departure after six innings. 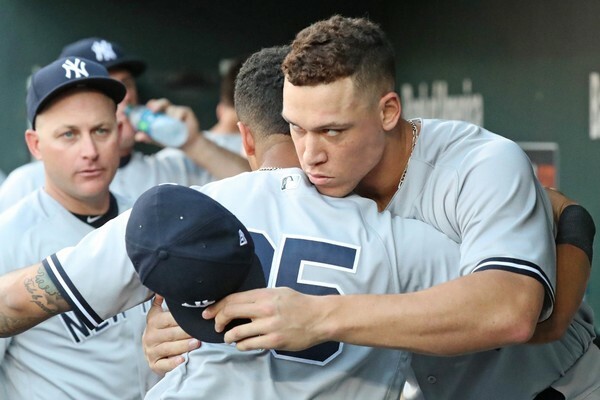 For as much as I have focused on Torres in recent days, there’s no question Aaron Judge is this team’s MVP. His seventh inning homer (his 16th dinger of the season and 41st RBI) gave the Yankees a three-run cushion they would not relinquish. Psychologically, this was huge, especially when Dellin Betances loaded the bases in the eighth with a couple of walks and a plunking of Orioles slugger Mark Trumbo. Fortunately, Betances was able to exit the inning unscathed when he got the unspectacular Jace Peterson out on a grounder back to the pitching mound. Aroldis Chapman struck out the side in the bottom of the ninth to secure the win for Gray and the Yankees. It was his 13th save of the season. I am grateful we continue to see 2016 Chapman and not last year’s version. The Boston Red Sox (39-19) lost again, their second loss in a row to the Houston Astros, so the Yankees (36-17) have narrowed the gap in the AL East to just a half game. The Astros, behind the pitching of Gerrit Cole, beat Chris Sale for the 7-3 victory. The Orioles are 21 games behind the Yankees. Wow, it’s only June 2nd. I do feel badly for O’s manager Buck Showalter. I am not sure that he’s going to survive this season. I used to love beating him but now he just looks so pathetic in the O’s dugout, loss after loss. I can still remember watching Showalter as a Double A player in the Yankees farm system as if it was yesterday. The team that was surprised me the most in the division is the 28-28 Tampa Bay Rays, currently in third. They’ve lost a couple games but for them to be playing .500 ball is impressive given the current talent struggles on their roster. They are playing more like how I expected the O’s to play instead of vice versa. The legendary Yankees career of Oliver Perez has come to an end. 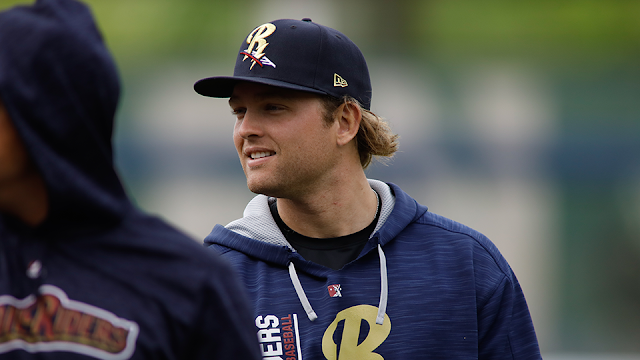 After signing a minor league contract earlier this year, Perez wasn’t awful for the Scranton/Wilkes-Barre RailRiders but there was no chance he was going to find his way to the Bronx. He exercised a June 1st opt-out and will have a chance to find a team with a clearer path of the Major Leagues. Good luck to him. Frankly, I am glad the Yankees never needed his services. Bryan Van Dusen wrote an excellent piece the other day about the value of the roster spots for the Yankees (too many good players to fit within the confines of a 25-man roster). I am always too quick to dump on Aaron Hicks but leave it to Van Dusen to provide the reminder for why Hicks is a valuable role player for the Yankees: “Aaron Hicks - I'm not sold on him being a starter, at least not for the Yankees, but if you look beyond a pedestrian batting average this season (.232) he's a solid player. He'll get on base at a decent clip, doesn't strike out much, makes contact often, and is a top ten defensive centerfielder in all of MLB.” As usual, I agree with Bryan. I’d love to see Clint Frazier at the Major Leagues, but for as much as I might like him over Hicks, Red Thunder is not going to experience MLB success in center field. He’ll make his mark with a corner outfield position and last time I checked, those spots are filled. Van Dusen suggested moving Gardy to center to open left for Clint Frazier but goes on to say letting Frazier crush it in Triple A to help his trade value might be the best path. Again, I have to agree. I love Red Thunder and it would be awesome to see him on the Yankee Stadium field. But this team needs pitching and Frazier might be the best trade chip. Nice job on your analysis, Bryan. It seems like I’ve been ripping on Chance Adams as much as I have Sonny Gray this year, but I have to congratulate Adams for his terrific outing last night. Adams, with 93 pitches, threw a shutout, scattering four hits, over 5 2/3 innings en route to a 4-0 win over the Indianapolis Indians. Adams struck out seven batters, but more importantly, did not walk anyone. If Adams wants to re-establish himself in the call-up pecking order, this is the way to do it. On a side note, every time I check a RailRiders box score, it seems like Cody Carroll is dominating hitters in relief. It’s almost unfair when the RailRiders take the field against Triple A opponents. A “MLB-ready” team that could effectively compete against many of the MLB teams facing minor league squads. The men among boys. It’s a nice problem to have. Lastly, Aaron Judge’s air high five for the missing Ronald Torreyes was a nice, but sad, moment in yesterday’s game. I am hopeful the Yankees can find a way to bring back Torreyes sooner rather than later but sadly it will probably take a trade to clear space. Too many good players, not enough roster spots. Today is a new day. The Yankees can capture first place in the AL East with a win and a Red Sox loss. Time to put Boston in the rear-view mirror. Of course, rain might have a say in the matter with the thunderstorms expected in Baltimore this afternoon/evening. Rain Gods, please delay your visit and allow America’s favorite team to win today. They say Walker's versatility was reason he was kept , excuse me Torreyes playes wB, SS. 3B , LF and hey we have Austin for 1B and RF. The thing to do was to trads Walker for a muid prospect and why does Shreve for that matter still have a zpot on this team has not been any good since August 1st year on the team. Time to move him , dump him or something. Torres gets out of his norm and swings to hard when moved up out of the 9 hole.I like him and Andujar there. Estevan Florial is the next Cf for the Yankees, no question about it! Clint Frazier can play CF but not up to the standards of the Yankees. As much as I want them to keep Frazier (injuries happen), we have a greater need for a very good pitcher! Trade Hicks, he has more trade power, or Frazier a young controlled player! Just remember, Cashmen will be dealing with a weak hand. While this team doesn't need Frazier this season, he can fill an obvious whole next year and beyond... left field. I don't think Frazier has to be in a deal for it to happen. I just said it on Twitter, but I'm warming up to Cole Hamels for the sole reason that his salary will keep his asking price down. And the Yankees have enough disposable talent in both MLB and the minors to make a deal w/o Clint. I'm sorry, but Florial is too far away from MLB for me to say he's in any way "untouchable". Don't give him up easily, but don't dismiss a trade because his name is attached to it, either. I have not seen Florial play so he may be years away instead of a very few. His numbers don't show him to be untouchable but it is his first real year in big time baseball (Tampa) at 20 years old. Good press may not be what one gets with him but, it would be a guy to keep an eye on. I couldn't care less about the numbers that low in the minors. My main point is that Florial shouldn't hold the team back from getting a good/young pitcher that could pair well with Severino to anchor the rotation for the 2-3 years before Florial would even see MLB.